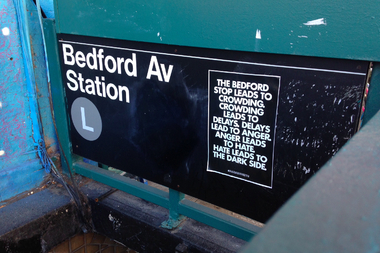 If you spend any time at the Bedford Avenue L train stop, you're doomed. WILLIAMSBURG — A coalition of politicians, business owners, developers and community groups are demanding a meeting with the MTA so it can finally get answers regarding its plan for a years-long shutdown of L trains between Manhattan and Brooklyn. On Monday afternoon, local politicians involved in the organizing efforts sent out a letter to the MTA seeking an audience with an agency representative at the group's meeting on Thursday. "It is important that your agency hears feedback from the people who will suffer the greatest impact," the letter from U.S. Congresswoman Carolyn Maloney, State Assemblyman Joe Lentol, State Senator Daniel Squadron and Martin Dilan, Borough President Eric Adams and City Councilman Stephen Levin says. "We are deeply concerned that the closure could leave commuters with no means of getting to and from the Williamsburg/Greenpoint area." In the meantime, the community group, "The L Coalition," as they're tentatively called, met for the first time last week, with Williamsburg business owners, local non-profits, both Greenpoint and Brooklyn's chambers of commerce, community board members and elected officials. "A coalition has been formed...we're going to work together to fight for information," said Felice Kirby, one of the organizers. Kirby, former Williamsburg restaurant owner and co-founder of Brooklyn Allied Bars and Restaurants, recalled a 1988 scare when city and state government thought they might have to tear down the Williamsburg Bridge, she said. "It couldn't be fixed," they'd been told, she said. "We marched back and forth along the bridge," united with Hasidic, Polish and Puerto Rican communities in the neighborhood, Kirby said. "We need to have one united voice...we need to brainstorm how to live through something like this cause it's gonna hurt." Though most involved in the L Coalition's first meeting hailed from North Brooklyn's Greenpoint and Williamsburg neighborhoods, coalition members said they planned on extending their reach along the L line out into Bushwick, East New York and Canarsie. As of Tuesday the MTA had not released any more specific details about a possible L train shutdown, according to spokesman Kevin Ortiz. The agency has only confirmed Jan. 13 news reports that the Canarsie Tube that connects Manhattan and Brooklyn will need serious repairs for damage done during Hurricane Sandy and could possibly shut down for years. "Once the lid is off they really have to step up to the plate and say something," said Charley Ryan, the owner of Brooklyn Bowl. "The longer they wait and not release an official press statement, the worse this will be."